Citation: Sangeda AZ, Maleko DD (2018) Regeneration Effectiveness Post Tree Harvesting in Natural Miombo Woodlands, Tanzania. 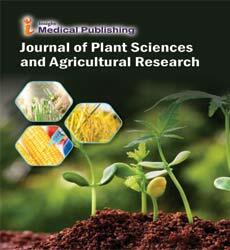 J Plant Sci Agric Res. Vol. 2 No. 1:10. Copyright: © 2018 Sangeda AZ, et al. This is an open-access article distributed under the terms of the Creative Commons Attribution License, which permits unrestricted use, distribution, and reproduction in any medium, provided the original author and source are credited. Miombo woodlands and forests cover about 40% of the Tanzania mainland. Miombo woodlands are distinguished from other African savanna, woodland and forest formations by the dominance of tree species in the family Fabaceae, subfamily Caesalpinioideae, particularly in the genera Brachystegia, Julbernardia and Isoberlinia. Miombo ecosystems comprise of high biodiversity rich areas such as the Selous Game Reserve, Mikumi, Katavi and Ruaha National Parks where is the home of various wildlife species including the endangered species such as the African wild dogs (Lycaon pictus) and elephants (Loxodonta africana). It is estimated that Tanzania loses about 1% (372,000 ha) of forests annually which include Miombo woodlands . The major driver for the Miombo woodlands cover loss being charcoal making to meet national cooking energy demands. This is owing to the fact that about 90% of the country’s cooking energy needs are satisfied through the use of woodfuels . Intense and high frequent wildfires plus the increasing crop cultivation and livestock grazing pressure exacerbate the problem of vegetation cover loss in Miombo woodlands. Regenerating capacity of Miombo ecosystem is a key to its productivity and ability to survive both natural and anthropogenic disturbances. After tree cutting there regeneration through coppicing of stem remnant (stump), root suckering and from the large bank of suppressed saplings does occur . Stump coppicing and root suckering are forms of regeneration which are known to allow much faster reestablishment than regeneration from seed. Also, stump coppicing and root suckering provide a degree of protection from fire and grazing . Harvesting methods play an important role in stimulating or retarding coppice growth. A clean cut with a saw results in more vigorous coppicing than a jagged cut from an axe. It is estimated that, the total annual growth of tree is 113 million m3 (all species and all land uses). Sixty percent (60%) of tree growth comes from unprotected areas especially under miombo woodlands . The estimated total consumption is 87 million m3 (mainly for energy, 90% of the energy comes from forest and miombo woodlands) creating annual deficit of 22 million m3 at the moment. The growing population and shrinking forest areas are increasing the pressure on remaining forest resource . In Tanzania, there have been discussions in the forestry sector, especially at the national level that harvesting of Miombo woodlands for charcoal making is not sustainable because regeneration is not guaranteed. These discussions can only be powerful if they are backed with scientific evidence. The study therefore, focused on assessing regeneration effectiveness in areas where trees were harvested for charcoal production. The study further qualitatively inspected the effects of livestock grazing on tree regeneration and wildfire occurrences in tree harvested areas in Kilosa district, Morogoro, Tanzania. The study was carried out in Kilosa District, Morogoro region, Central-East Tanzania (5° 55'-7° 53' S and 36° 30'-37° 30' E) and covers 12,394 square kilometers. District (Figure 1) has tropical climate with the mean annual temperature of 25°C. It has binomial rain fall which split between the short rains in November to January and the long rains between March to June which range from 800 mm to 1300 mm in the low and high altitude areas respectively. This ecosystem is mainly endowed with both natural forests and woodlands. Woodlands and forest cover about 40% of the total land area. The current coverage of central government forest reserves is about 97,700 ha managed by the Tanzania Forest Services. District Council Forest Reserves cover an area of 24,654 ha and the area under Village Land Forest Reserves is about 124,335 ha . 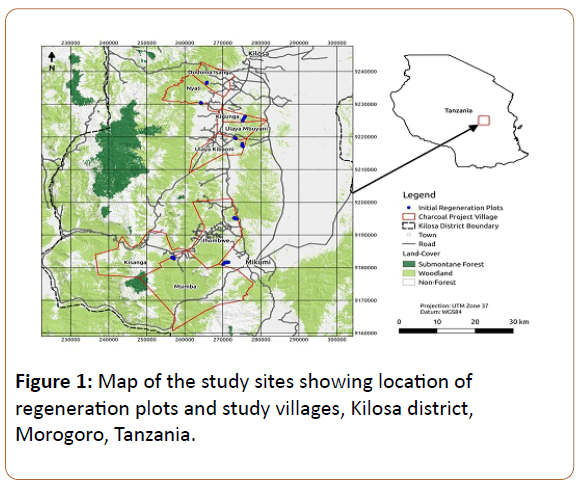 Figure 1: Map of the study sites showing location of regeneration plots and study villages, Kilosa district, Morogoro, Tanzania. The research design for this study was a cross-sectional survey whereby data were collected in single point in time, combining qualitative and quantitative approaches. Regeneration measurements were done between August and September, 2015. The study was carried out in eight villages in Kilosa District. Circular plots of 15 m radius were established at the center of the 50 m × 50 m charcoal harvesting blocks . A total of 69 regeneration plots were established. All stumps within the plots were counted, growth and regeneration measurements taken. Grazing and fire incidences were qualitatively assessed within the plots. A total of four (1 m × 1 m) square subplots were established in 4 cardinal directions at the 7.5 m mark of the radius for assessing seedlings abundance and diversity. At least eight villages had started harvesting charcoal in sustainable manner using the project model in average of 300 m × 300 m blocks since 2013. Variables recorded included; Diameter at Breast Height (DBH) and Basal Diameter (BD) of trees and stumps respectively, height of coppices, height of seedlings, tree heights and slope angle. NARFOMA botanical guide for tree species identification, field forms for data recording, Camera for taking photos and other stationeries for record management were used (Table 1). Table 1: Distribution of regeneration plots in the study sites, Kilosa Tanzania. Data were entered into Microsoft Excel spreadsheets for compilation and the Shannon wiener index formula (equation 1) was used for calculation of seedlings’ diversity. The statistical package for social sciences (SPSS) version 21 was used to generate. where; H’ = Shannon-Wiener diversity value, pi = Proportion of the ith species, ln = natural logarithm. A total of 903 sample stumps that correspond to about 185 stumps/ha were measured. The overall stump diameter and stump height were 22.34 ± 0.43 cm and 53.64 ± 0.76 cm respectively. It was observed that 67.7% of all stumps were regenerating through coppices or sprouts. Stump vegetative regeneration at the plot level ranged from 17 to 100% with an average of 64.4%. This trend is similar to what was found by Luoga et al. , whereby an 83 to 90% of regeneration of Miombo species in a different district of Tanzania was reported. Furthermore, about 50% of the measured stumps were found to develop coppices with an average of six (6) individuals per stump and with overall mean height of 102.30 ± 3.47 cm. Also, about 37% of the stumps were observed to develop new stems from the roots (root sprouts/suckers) that averaged five (5) individuals per stump with overall mean height of 87.53 ± 3.33 cm. Luoga et al. reported up to 6.6 regenerating shoots per individual stump in general lands. The overall mean coppice number/ha was 88 ± 4 whilst the mean root sprout/sucker number/ha was 66 ± 5. It was further revealed that all 903 tree stumps belonged to 40 different tree species in which 85% and 60% of the species were found to develop coppices and root sprouts respectively. Moreover, 57.5% of the tree species harvested for charcoal were observed to develop both coppices and root sprouts on the same plant as a means for vegetative propagation. The most frequently harvested tree species for charcoal making were Brachystegia boehmii (myombo) and Brachystegia spiciformis (mhani/mtondoro). These species comprised of 36.3% and 20.8% of the total measured tree stumps respectively, other charcoal harvested tree species are as shown in Table 2. Table 2: Preferred tree species for charcoal in the study sites, Kilosa, Tanzania. Despite the fact that the stumps of B. boehmii and B. spiciformis were observed to exhibit both coppicing and root sprouting, B. boehmii was relatively robust in coppicing and especially the stumps with less than 30 cm diameter were observed to develop thicker and taller coppices than old tree stumps (>30 cm diameter). B. spiciformis was observed to do best through root sprouting and most stumps did not have coppices and with advance of dry season and upon exposure to fire most immature coppices (<30 cm height) were found either wilted or dead. Moreover, B. microphylla, D. condylocarpon, Combretum and Acacia spp were observed to regrow robustly in terms of both coppices and root suckers. In some instances, the coppices of these species were found to achieve a height of up to 3 m within one year after harvest. According to Shirima et al. , miombo woodlands demonstrate a remarkable capacity to recover after disturbance due to tree regeneration from the roots and stumps and they have been shown to do this after agriculture, charcoal production and selective logging. Some species regenerate better than others, and young healthy trees coppice better than old and senescent trees . In general, tree of large size basal diameter classes were not showing much vegetative regeneration at the time of this study (Table 3). Thus, more monitoring is needed in order to know after how long they will start to coppice/sprout or die. However, literature has shown that the height of cutting also influences coppicing. The greater the height at which the stem is cut, the greater the number of resultant coppice shoots [7,8]. Regrowth on stumps cut higher than 1m above ground will be better protected from fires and browsing animals . Table 3: Percentage of regeneration by stump basal diameter classes. From Table 3 it can be revealed that regeneration decreases with increasing tree diameter. Therefore sustainable tree harvesting would be around diameter class of 20 to 30 cm DBH. This diameter class was also found optimal by the study of Luoga et al. . Harvesting below this diameter leads to higher regeneration effectiveness but less biomass would be produced. Harvesting above these diameter classes will lead to higher biomass production but there is increased risks for no regeneration. The balance would therefore harvest at optimal levels as shown in Table 4 shows the summary of regeneration parameters under various regeneration pathways. Table 4: Summary of regeneration effectiveness pathways. From Table 4 it can be revealed that miombo woodlands regenerate better through coppices followed by root sprouts and lastly through seedlings. Better heights are also attained through coppicing rather than root sprouts. Therefore, vegetative propagation of the harvested miombo trees is more vigorous than through seedlings recruitment. In every harvested block there was at least one kiln placement which left a scar on the ground. In some few cases depending on topography and easiness to dig soil for a kiln placement, the kiln was placed outside the harvested block. Visual observation in most kilns of 2013 and 2014, no regeneration of tree species is observed yet inside the kiln areas. Only 10% of 2013 kilns were observed to have herb species such as wild amaranths but 100% of the 2014 kilns were completely devoid of vegetation. However, it should not be taken as a conclusion that Miombo tree species do not regenerate on kiln scars because, most of Miombo tree seeds have prolonged seed dormancy which may take a longer time to regenerate. A conclusion with regard to regeneration on kiln scars needs more data through monitoring studies. Figure 2 shows the status of regeneration on kiln scars after two years of harvesting. 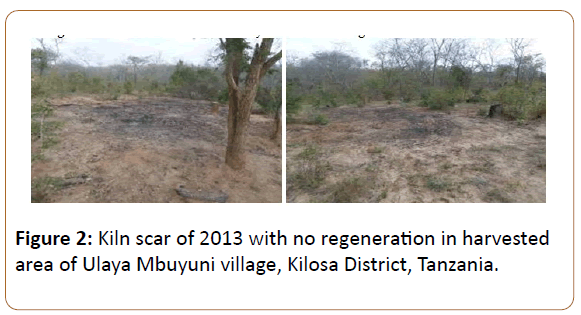 Figure 2: Kiln scar of 2013 with no regeneration in harvested area of Ulaya Mbuyuni village, Kilosa District, Tanzania. Results showed that on average, diversity of regenerating tree species was slightly lower compared to that of un-harvested tree species. Mean diversity index value of regenerating species was 1.7 while that of un-harvested tree was 1.9 out of possible 5.0 in all the 8 forests/villages (Table 5). The low diversity of regeneration through seedlings can be caused by several factors including fire, grass cover and seed dormancy. Table 5: Diversity of seedlings and original standing tree species using Shannon Wiener index. Further, results showed that there was no regeneration of invasive tree species in the study sites. A total of 27 common tree species were found regenerating in all the eight study villages. The overall mean height of tree seedlings was 37 ± 3.6 cm and the seedling density was 57 ± 2/ha. The dominant tree species of regenerating trees included B. spiciformis (34%), B. boehmii (13%), D. cinerea (8%) and F. virosa (6%). Others were D. condylocarpon, B. microphylla and ‘Mtutuma’ (all 4%). These common plant species of miombo woodlands are almost similar to those reported by Nduwamungu  and Ishengoma et al. ) in Kilosa District, that the most frequently encountered species in miombo woodlands are Brachystegia boehmii and Brachystegia spiciformis. Other species appeared once in each plot despite of being in the same ecological zone where rainfall pattern and edaphic factors are almost the same. This variation is presumably linked to existence of different level of disturbance in the forest. Luoga  argue that among the factors associated with the variation in species composition and richness in miombo woodlands is disturbances, especially when edaphic factors are similar. Furthermore, Munishi et al. argue that sparse distribution of some species may be an indication of natural phenomena (species having restricted range), outlines species population outside their normal range or may represent species at state of decline or as results of human impacts and utilization pressure. About 49% of the established regeneration plots were burnt in various intensities depending on fuel (grass and litter) density. Results on average regeneration suggest that le	ss fire is generally better, but the pattern is very clear for higher intensities of fire (perhaps due to low sample sizes) (Table 6). Table 6: Influence of fire on regeneration of coppices and sprouts. Fire was found to have both advantages and disadvantages in the surveyed areas in which it was found to trigger root sprouting in many tree species including B. boehmii and B. spiciformis in which areas burnt between July and August 2015 were observed to have immature root sprouts in late September, 2015 (Figure 2). However, in many cases intense fire was found to kill most seedlings with soft barks especially in areas with taller grasses and in steep slopes. For example, less regeneration was recorded in Nyali, and most surveyed areas of Ihombwe and Dodoma Isanga due to intense wildfires (Figure 3). Figure 3: Showing recently burnt area (LHS) with no regeneration and a site where B. spiciformis seedlings are establishing themselves about two months post fire (RHS) in Kilosa Tanzania. Average tree canopy cover was estimated to be 6.34% in all regeneration plots implying that most harvested areas were open. Despite the fact that there was insignificant relationship between residual canopy cover and vegetative regeneration, most seedlings and root sprouts were visually observed to prefer open areas (Figure 4a). The seedlings that were observed to be dense in open areas included those of B. boehmii, B. spiciformis, P. angolensis and D. melanoxylon. However, regeneration in terms of seedlings was observed to be poor in areas dominated by tall grass species (over 1.5 m height) that were too dense. Dominant grass species were Themeda triandra (red grass) and Hyparrhenia rufa (thatch grass) that were very dominant in high altitudes (650 -850 asl) and along steep slopes, for example in Msimba and Dodoma Isanga villages (Figure 4b). The aforementioned grass species were also the major sources of wildfires due to their ability to accumulate higher biomass, thus affecting regeneration negatively. Table 7 shows intensity of burn in the study villages. Fire and browsing pressure negatively affects growth rate of regenerants, especially in the first year after cutting. Trees cut during the dry season dormancy period regenerate better than those cut in the growing period (rainy season). This conforms to Lowore and Abbot  findings that some species regenerate better than others, and young healthy trees coppice better than old and senescent trees. The suppression of saplings is caused mainly by light competition; when canopy trees are felled the saplings begin to shoot up rapidly and contribute significantly to the stock of additional trees in the stand. Regrowth from coppice and the growth of suppressed saplings usually results in very high stocking rate in young regrowth. For this reason, enrichment or replacement planting of seedlings is seldom practiced or required . Enrichment planting is however a means to alter the species composition of the woodland, or to ensure regeneration of certain high value species. Table 7: Fire intensity in the plots under harvested areas in study villages, Kilosa Tanzania. Figure 4: Seedlings of B. spiciformis occupying an open area at Ihombwe village (LHS) and a cover of T. triandra and H. rufa grasses (RHS) at Dodoma Isanga village, Kilosa Tanzania. Grazing of livestock (cattle, goats and sheep) and wildlife (antelopes) was noticed in the harvested areas (56.5% of the total plots) in form of animal droppings and leaf defoliation (Table 8). Results showed no statistical relationship between grazing intensity and vegetative regeneration. There was neither relationship between vegetative regeneration and grass cover nor grass height. However, the effect of grazing on initial regeneration was minimal as the grazing intensity was low in most sites and the herbivores were noted to consume grasses while no signs of seedling consumption were noted. Similarly, Kigomo  and Mtimbanjayo  reported that when the grazing pressure increases have eventual negative affects to tree regeneration. Table 8: Grazing intensity in the plots under harvested areas in the study sites, Kilosa Tanzania. Also, no signs of heavy vegetation trampling or soil damage were observed. Occasionally, new coppices of P. maprouneifolia were observed to be browsed and locals revealed that it is preferred by some wildlife species in particular small and medium antelopes such as dikdik (Madoqua kirkii) and impala (Aepyceros melampus). Grazing incidences were higher in Ihombwe and Msimba villages whilst in Nyali and Dodoma Isanga no grazing incident was observed perhaps because most areas were recently burnt (Figure 5). It was also observed that light grazing is beneficial to regeneration as it reduces grass cover (fuel load) that is responsible for wildfires, a good example of light grazing was observed in Ulaya Kibaoni, Ulaya Mbuyuni and Kigunga villages where there was no fire and relatively flat terrain was observed in these villages as shown in Figure 5. Figure 5: Fire and grazing intensities in the study sites Kilosa Tanzania. Findings of these studies conclude that generally, there is a robust regeneration of the harvested Miombo tree species through coppicing and root suckers in harvested areas. However, regeneration through seedlings and its associated diversity was relatively low as compared to that of original standing tree species. Sustainable harvesting diameter class is between 20 and 30 cm DBH. This is the optimal class where biomass production for charcoal making and regeneration effectiveness can be optimized. B. spiciformis regenerate much better through root sprouting and B. boehmii through coppicing. High intense fire was found to damage seedlings, root suckers and coppices especially in areas with heavy fuel load (tall grass) and steep slopes. Less intensive fire stimulated development of new root suckers during dry season. For the first two years after harvesting, there was no tree species found regenerating through seedlings in the kiln placement areas. • For sustainability and optimal performance in regeneration, harvesting of miombo trees should be done for trees with DBH of 20 to 30 cm. • There is a need for a continuous monitoring in the harvested blocks for the next few years to assess the status of regeneration in the kiln scars. A specific ecological study can then be done to investigate the status of regeneration in kiln scars. If regeneration does not happen, action steps such as enrichment planting of indigenous tree species can then be done to reduce environmental risks associated with bare grounds especially in slopes. • Efforts to reduce fuel load in the forest is a must for a better survival of immature seedlings, coppices and root suckers/ sprouts. Further research on on properground fuel control such as prescribed fire and controlled grazing are suggested. • Further detailed study to investigate the effect of tree age on regeneration is required. This is based on the observed trend on decrease in number of coppices and root suckers with increase of tree stump diameter (age). NAFORMA (2015) National Forest Resources Monitoring and Assessment of Tanzania. Luoga EJ, Witkowski ETF, Balkwill K (2004) Regeneration by coppicing (resprouting) of miombo (African savanna) trees in relation to land-use. For Ecol Manag 189: 23-35. Piearce GD (1993) Natural regeneration of indigenous trees: the key to their successful management. In: Piearce GD, Gumbo DJ (editors) The Ecology and Management of Indigenous forests in Southern Africa. Proceedings of an International Symposium, Victoria Falls, Zimbabwe. KDC (2012) Kilosa District Socio-economic profile. Jointly prepared by Institute of Rural Development Planning and Kilosa District Council p: 76. Shirima DD, Totland Ø, Munishi PK, Moe SR (2015) Does the abundance of dominant trees affect diversity of a widespread tropical woodland ecosystem in Tanzania? J Trop Ecol 31: 345-359. Lowore JD, Abbot PG (1995) Initial regeneration of miombo woodland under three silvicultutal systems. In: Lowore J, Abbot PG, &Khofi CF (eds.) Management of miombo by local communities. Proceedings of a workshop for technical forestry staff. Forest Research Institute of Malawi and University of Aberdeen. Shackleton CM (2001) Managing regrowth of an indigenous savanna tree species (Terminalia sericea) for fuelwood: the influence of stump dimensions and post-harvest coppice pruning. Biomass Bioenergy 20: 261-270. Kaschula SA, Twine MC, Scholes MC (2005) The effect of catena position and stump characteristics on the coppice response of three savanna fuelwood species. Environ Conserv 32: 76-84. Nduwamungu J (2001) Dynamics of Deforestation in Miombo woodlands: The case study of Kilosa District, Tanzania. Dissertation of the Award of PhD Degree at Sokoine University of Agriculture, Morogoro, Tanzania. Pp:278. Ishengoma R, Katani J, Abdallah JM, Haule O, Deogratias K, et al. (2016) Kilosa District Harvesting Plan. Luoga EJ (2000) The effect of human disturbances on diversity and dynamics of eastern Tanzania Miombo arborescent species. A thesis submitted to the Faculty of Science, University of the Witwaterrand, Johannesburg in fulfillment of the requirements for the degree of Doctor of Philosophy. Munishi PKT, Shear TH, Wentworth T, Temu RPC, Maliondo SMS (2005) Sparse distribution pattern of same plant species in two afromontane rain forests of the Eastern Arc Mountain of Tanzania. TJFNC 10: 74-90. Chidumayo EN, Gambiza J, Grundy I (1996) Managing miombo woodland. In: Campbell BM (ed.) The miombo in transition: woodlands and welfare in Africa.CIFOR, Bogor Pp: 175-194. Kigomo B (2003) Forests and woodlands degradation in dryland Africa: A case for urgent global attention, Paper presented at the XII World Forestry Congress, Quebec, Canada. MtimbanjayoJ(2017) Assessment of ecological effects and community perception of cattle grazing in Miombo woodlands, Kilosa, Tanzania. A dissertation submitted in partial fulfillment of the requirements for the Degree of Master of Science in Environmental and Natural Resource Economics of Sokoine University of Agriculture.